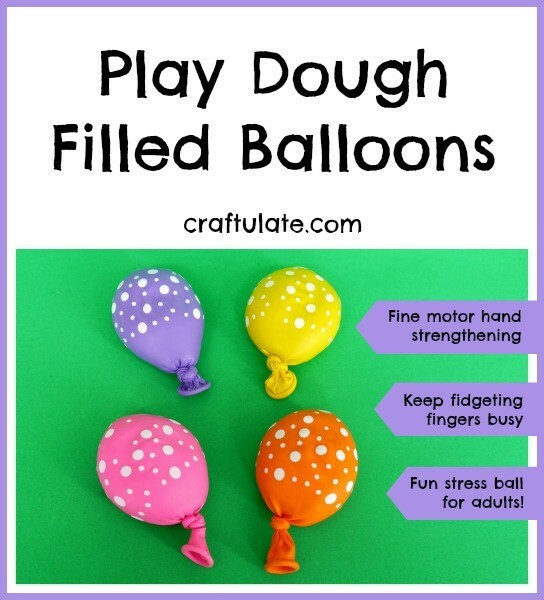 These play dough filled balloons are perfect for kids that fidget and/or need to work on hand strength, and even as an adult stress ball! I remember seeing stress balls made from balloons being sold in street markets in France over two decades ago. It’s hard to say why we were so fascinated by them, but we were. Those balloons were filled with flour, and although I was quite a careful child, the inevitable happened and there was a huge mess. When I realized that I could fill them with play dough, I just had to make them again! All you need are balloons and play dough. This is a great way to use up slightly “crusty” play dough, or play dough that has had the colors mixed together beyond recognition. In fact, I used the play dough from our Play Dough Construction Site – I nearly threw it out but thought about making these instead! 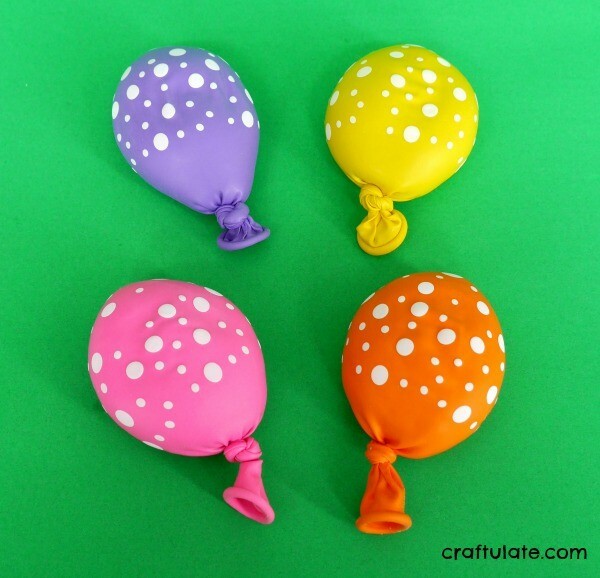 To fill the balloons, you need to roll the dough into tiny logs and feed them into the balloon. 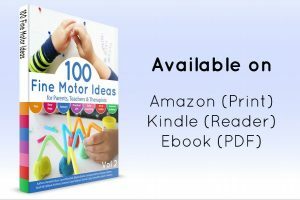 Actually if your child has the patience this would make a great fine motor activity! 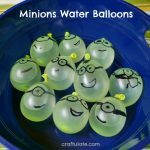 It took me about 8-10 minutes to fill each balloon though! 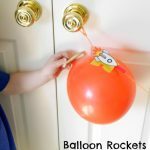 At first, the little logs will just fall in through the neck of the balloon – although every now and then you might need to close the opening and shake them down. Then it will start to get a bit trickier, and you’ll need to work the dough down into the balloon so it attaches to the other pieces of dough, freeing up the neck for more dough. Inevitably a piece will get stuck and you’ll poke your finger inside the balloon to free it. Your finger will then get stuck too and you’ll have a moment of thinking “what AM I doing?!? !” Or maybe that’s just me. Anyway, keep filling and squishing and try to get as much play dough into the balloon as possible. Then tie a knot in the end. If you have plain balloons then you can draw silly faces on with permanent marker if you like, but as we used spotty ones (I think they were leftover from our Balloon Tennis activity!) I decided against. My son was very intrigued by them, and it should be noted that he does NOT LIKE latex balloons when they are blown up. One of the reasons that I wanted to make these was to test his reaction. So I was delighted when he asked to see them and then spent some time poking and squishing them. He even identified them as balloons and still kept playing. He then decided that they were “airbags” which presumably comes from a video he was watching where they tried to get a tipped-over-truck back on its wheels by putting air bags underneath. He is SO into pretend play right now! Since then he has used them for all kinds of things, stopping to poke and squeeze them every now and then. However, I’ve managed to steal one to have on my desk as it makes the perfect stress toy! 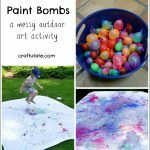 If you’d like more fine motor ideas, head on over to see what the rest of the Fine Motor Fridays team has been up to! Omg! This is such a great idea! My son has been obsessed with balloons lately and I tried to make a stress ball with flour, but like you said it didn’t last long and I ended up with a mess! Plus it is so hard to get flour into a balloon! I’ll have to try this method, it looks much easier! Love this idea! They make great fidgets. 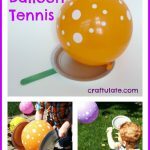 Not sure if I’ll have the patience to get the play dough in the balloon though, lol! LOL Emma! It was actually quite therapeutic! !